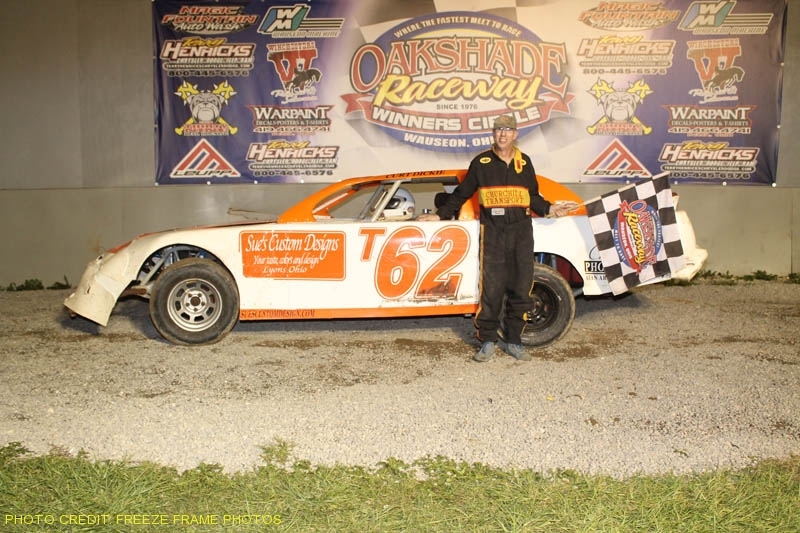 Dona Marcoullier of Houghton Lake, Michigan held off a hard charging Rusty Schlenk to capture the UMP Late Model feature win at Oakshade Raceway Saturday night. Marcoullier started on the outside of the front row and got the jump on pole sitter Tyler Boggs. Boggs and Marcoullier pulled away from the rest of the field early until Schlenk moved up to third and began to close in. A caution for an incident involving Steve Kester, Chris Ross, Dan Wallace and Mike Miller tightened the field on lap six. Schlenk took advantage of the restart and took second away from Boggs shortly after the green flag flew once again. Ky Harper had a top five run going but retired to the pits on lap 10. One lap later, Tyler Boggs spun in turn two while running second, forcing him to restart at the tail of the field. Jon Henry assumed the third position and he along with Schlenk began to pressure Marcoullier for the lead. Schlenk went to the high side and Henry hugged the inside with Marcoullier holding the lead in the middle. Eventually things settled down and Marcoullier had a little cushion over second place Rusty Schlenk, but in the final laps Schlenk closed up right on his rear bumper once again. Schlenk had a good run coming off turn four on the final lap, but Marcoullier was able to edge him out for his second feature win in his last two visits to Oakshade Raceway. The rest of the top five finishers started deep in the field. Jon Henry started 15th and finished third. Last week’s feature winner, Wayne Chinn, passed the most cars after starting 19th and ended up fourth with Dusty Moore moving up from starting 17th to finish fifth. Brian Fisher and Brett Miller each have one UMP Sportsman Feature win this year and both drivers started in the front row. Fisher took the early lead in the feature with Josh Steinacker going around the outside of Fisher for the lead on lap four. After a lap five caution, Fisher reclaimed the lead from Steinacker for one lap, but then Steinacker regained command and began to pull away. Miller eventually took second from Fisher and began to pressure Steinacker for the top spot. Just as they were about to take white flag, Miller spun in turn three while challenging for the lead and brought out the yellow flag. Steinacker went on to become the third different UMP Sportsman Feature of the year with Fisher taking second. Tim Line was third with Matt Lindsey fourth. Tim Fisher started 15th and ended up fifth. Last week Jerry Signor ended his night upside down at the start of the Bomber A Main, but he kept all four wheels on the ground this week and led the A Main from flag to flag. Jim Scout started 10th and worked his way up to second by lap eight. Signor had built up a big lead, but a spin by Dan Plath brought out the caution on lap 10 which nullified Signor’s advantage. Signor held off Jim Scout to earn the feature win. Ron Tolles took third followed by Danny Hogrefe and Craig Dippman. Josh Froelich spun on the first lap of the UMP Hornet Feature in turn two and Curtis Spurgeon plowed into him hard ending both drivers’ night. Adam Noonan started on the pole and easily picked up his second consecutive feature win of the year. Drew Smith finished second for the third consecutive week. Gabe Mueller, Tyler Line and Derek Morris were the rest of the top five finishers. Jamie Grochowski won the UMP Bomber A Main a week ago, but could only muster earning a UMP Bomber B Main starting spot this week through his heat event. Grochowski started on the pole and led the entire distance for the UMP Bomber B Main feature victory. Tim Mullendore finished second followed by last week’s C Main winner, Matt Lane, who started deep in the field. Jim Plotts finished fourth and Bob Krumm was fifth. The Bomber C Main was the final event of the night. Dustin Sautter wasted no time getting to the front, taking the lead by the end of the first lap. Sautter never looked back opening a commanding lead and went on to pick of the victory. Rick Dixon started to slowly reel in Sautter, but had to settle for a distance second. Bob Mayer, Randy Murday and Robert Meinen rounded out the rest of the top five finishers. The fastest will meet to race once again at Oakshade Raceway in the UMP Late Model, UMP Sportsman, UMP Bomber and UMP Hornet divisions on Saturday night with gates opening at 4pm and racing at 7pm. *Standard text messaging rates may apply from your carrier.